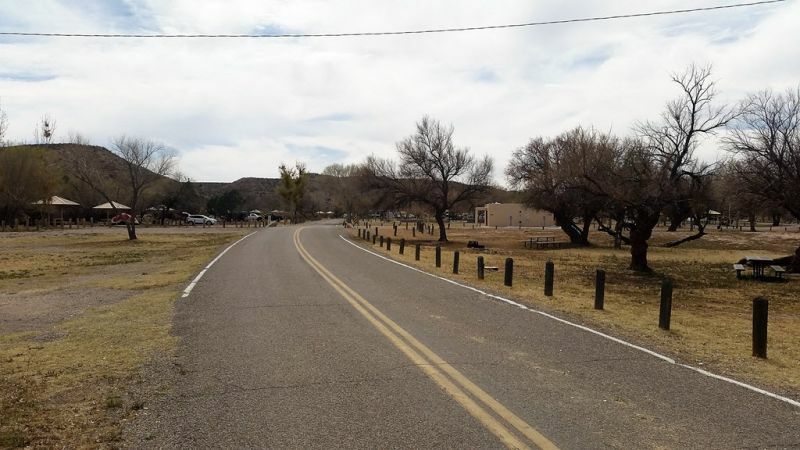 After leaving Elephant Butte State Park, we headed to the Volunteer Travel Campsites (32.3774, -106.4913) located on the White Sands Missile Range (Army Post). This is a small, 8-site RV Park located on the main portion of the Army post. It's very quiet here, with wonderful views of the Organ Mountains. A pretty good deal for only $10 a night with full hook-ups. It's located between Las Cruces and the White Sands National Monument. While staying here, we visited the nearby Holloman AFB FamCamp and the Oliver Lee Memorial State Park. We planned to go to the White Sands National Monument, but it was extremely windy for a couple days and we had visited this National Park before. So we didn't get there on this trip. We checked out the state park, trying to decide where our next stop was going to be. While this is a nice, quiet, and small state park, there were no available sites. Not even dry-camping sites. Between 1991 and 1993, we were stationed at Holloman AFB. It was interesting to return to the base and check out our old on-base housing and where I worked. The base hadn't changed much, but there were a few more hangers. Back in the early 90's I assisted with the transfer of the F-117 Stealth Fighter from it's "black" operations to being public at Holloman AFB. Nowadays, Holloman AFB doesn't have the F-117 anymore. It looks like their main mission now is to train and support Reaper Drones, train fighter pilots, and train the German Air Force. ​We only stayed at the Missile Range for 5 days and decided to head back towards Truth or Consequences. We ended up going to the Caballo State Park using our New Mexico annual camping pass. We were willing to dry-camp for free, but were able to get an electric site for $4 a night. While here, we went back to Sparky's Hamburgers in Hatch, NM to get their delicious chili cheeseburger again. While in Hatch, Connie bought 5 pounds of chopped green chili's for $9. We had some last night on rib-eye steak - yumm! Otherwise, we haven't been doing much here other than working on the computer. One of my contract jobs is to maintain the CLM Services website. I've been working on a complete update and redesign of their website. I've accomplished a lot in these past few days. I’m sure Connie’s green chili was wonderful. Looks like you are having a great trip I’m sure Connie’s green chili was wonderful.